TEAM CRESTED BUTTE: The 5 Peaks Race Report -Don't Ever Give Up! The 5 Peaks Race Report -Don't Ever Give Up! 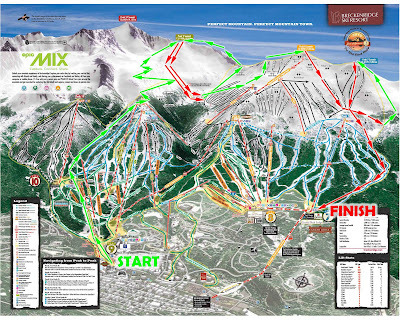 The 2nd addition of The 5 Peaks race in Breckenridge went off rather well, all things considered....the seventh stop of nine races on the COSMIC tour this year saw a revamped course with racers going South to North across the Ten Mile Range above the resort of Breckenridge. Last year Jon Brown & I teamed up, but this year I couldn't find a soul from the Gunnison Valley to race with as everyone else had "something else" going on. As luck would have it Mike Kloser needed a partner and I was game! I have always been a competitor of Mike's whether it was adventure racing or skimo racing...he was the "enemy", so it was great to finally team up! His racing prowless is certainly well documented, so needless to say we signed up to win! The race course effectively took us across Peaks 9,8 & 7 . This "partners style" of racing is an attempt to mirror what actually happens in back country skiing...always skiing with a partner, so team chemistry in this race (much like the Elk Mtn Grand Traverse and Aspen's Power of Four) is critical...."you are only as strong as your weakest link". Unfortunately due to me breaking a ski.....I was the weak link....Grrrrrrrrrrr! The race start was at 6am and took us up to the top of the resort and through a back country gate, heading up the South side Peak 9. As we left the gate, we got out above tree line and got our first taste of the winds out of the South/South West. Mike and I were leading the charge with eventual winners Max Taam/Pete Gaston right on our heels. The resort skiing was fairly benign, and got ramped up as we hit the wind hammered sastrugi snow which challenged your technical climbing abilities. At the skin up transition I saw Taam/Gaston already heading out of the transition, having nuked the descent...they are stellar down hill skiers so I knew I had my work cut out with this broken ski. Mike Kloser kept his cool and encouraged me to keep going until it totally broke, so I skinned up and we began to chase 1st place back up the North side of Peak 9. The ski was skinning OK so Kloser & I pressed on and slowly began to real them back in. Due to a lack of snow on the North side of Peak 9 all teams encountered a 25 minute boot pack to gain the summit. The winds were oppressive at times but all the while Kloser and I widdled away at the gap and actually topped out with Taam/Gaston on the summit....this is how the rest of the race would unfold...they would pull away on the downhills and we would put in big efforts to shut the gap down by the summits. The second descent followed the first descent, so it was familiar territory back to the transition. The third climb took us up the South side of Peak 8 with a boot pack up the Lake Chutes, just like last year. With the 3rd place team still not in site we figured we could certainly hang on to a top two position...unless my ski really blew up! Most of the time in these skimo races you never think twice about the mandatory gear, especially a helmet. This year I almost had to use it. Taam/Gaston had a 10 meter gap on my self and Kloser as I led Mike up the booter, when all of a sudden I heard screaming above me....at first I thought (with all the loud wind) that it was some folks cheering on the top team ahead, when in fact they were all yelling at Mike & I...ROCK!! !....I looked up only to see a 50-80lb chunk of earth flashing right towards me....direct line of fire, ugh! No I didn't take it on the helmet, but Mike and I did certainly got out of the the way...it reinforced why we wear helmets in these races! We once again closed the gap and topped out with Taam/Gaston on the top of Peak 8. As we approached the transition on the summit we all were psyched we had winds from the South as the gusts of 40-60MPH gave us an aided boost up to the summit and nearly over the top....the winds were down right ridiculous at times!...it made folding your skins an origami experiment...that's why we carry a minimum of two sets! Taam/Gaston had it in the bag. Luckily for me my ski never completely disintegrated and allowed me to get down to the finish only a couple minutes behind the 1st place team, and never got caught by the team of Simmons/Kroger who finished in third. So how was it to race with Mike Kloser?? I'd say everything I expected it to be...he is super strong, confident, and encouraging (when the chips are down.....or you broke a ski! ), a pro! Congratulations to Max Taam/Pete Gaston for giving us a great fight and taking the victory! In case you were wondering what racing through 50mph winds looked like....Kevin Krill captured it all! What's the inside of your ski look like?